I am feeling shockingly – and slightly uncomfortably – au courant with my loot this week. It is not natural for me to have this many new books in my possession. I’m sure my borrowing habits will correct themselves shortly but for now I will enjoy the unfamiliar thrill of reading books that other people have actually heard of and which are readily accessible from any well-stocked bookstore. The Pebbled Shore by Elizabeth Longford – probably the book I am most excited about this week. After reading My History by Antonia Fraser, I’ve been longing to know more about her fascinating mother, Elizabeth Longford. Thoughtfully, she took the time to write this much-praised memoir. In the Unlikely Event by Judy Blume – I am always up for some Judy Blume. Savage Continent by Keith Lowe – after having checked this out roughly a dozen times (which sounds like a waste of effort but did result in bringing it to Maphead’s very appreciate attention), I have finally started reading it and it’s just as powerful as I expected. 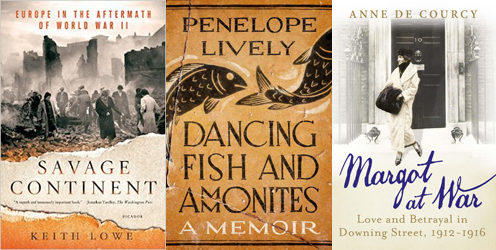 Dancing Fish and Ammonites by Penelope Lively – another book I’ve checked out countless times without managing to read. Margot at War by Anne de Courcy – A new Anne de Courcy biography! About Margot Asquith! My cup runneth over. The Music at Long Verney by Sylvia Townsend Warner – I am reading a collection of Sylvia Townsend Warner’s letters right now and they’ve finally provided the push necessary to get me to try some of her fiction. Can’t wait to dip into this book of short stories, edited by Michael Steinman, who also did a marvellous job editing a superb collection of Warner’s letters back and forth with William Maxwell. 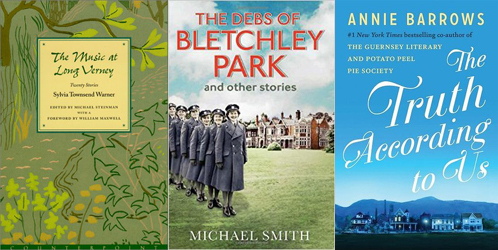 The Debs of Bletchley Park and Other Stories by Michael Smith – Anything that has “Debs” and “Bletchley Park” in the title sounds good to me. The Truth According to Us by Annie Barrows – This sounds like a perfect summer read and the reviews I’ve seen so far have me intrigued. Wow, great haul this week. Definitely adding some of these to my wishlist. 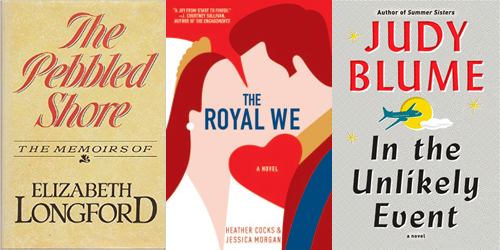 I’ve read The Royal We, I hope it is more fun for you than it was for me (hey that rhymed). Turns out I am with you: it`s horrifically bad. Not fun, campy bad. Just plain awful bad. Yep, thats what I thought too…it wasn’t even sarcastically or satirically good. 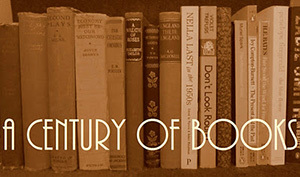 Seeing how many great books you’ve gotten amkes me wish I had gotten to my library recently! I read the Royal We a couple weeks ago and I enjoyed it a lot. Some parts are a little dry and may be a slight struggle to get through but overall it was an entertaining book I think. Happy Reading! I’m sitting on library fines that need to be paid, so, what did I do? I bought The Goldfinch, which is our September book discussion choice. At least it was in paperback. 🙂 Always enjoy your “loot”. Pay your library fines, Penny! 🙂 Still, most people I know who’ve read The Goldfinch adored it so I’m sure it was a worthy addition to your collection. Oh dear, I think I want to read almost every one of the books you mentioned. Clicking over to my library website now to see what’s available. I’ll keep my fingers cross for you as your search through your library’s catalogue. The Truth According to Us is my favorite read of this year! I hope you enjoy it as much as I did. My library was pretty picked over yesterday, so not much loot, but I did get Susan Meissner’s Secrets of A Charmed Life and Ken Hauth’s Our Souls At Night. Happy reading! That’s great to hear, Alana! I’m looking forward to starting it. That William and Kate movie was TERRIBLE. And I still totally enjoyed it – one of those movies that is so so sooooo bad that it’s fun to watch. If you survived that, you will for sure survive the book. It’s much better. I found it more realistic about the business of monarchy. That Bletchley Park book sounds good! Curious to hear what you think of it! SO TERRIBLE. But not terrible enough that I didn’t immediately go to Netflix after reading your comment to check…but I can’t find it there any more. That’s probably for the best. Great choices. I want to read those memoirs. I hope you’re able to track them down, Terra. The Debs of Bletchley Park came up for me yesterday! I’m really looking forward to digging into it. Doesn’t it look great? Happy Reading to us both! I’ve got a slew of books that are due soon and cannot be renewed any more, so I’m glad to see I’m not alone in having to check out books again after failing to read them the first round. Definitely not alone. Our library allows borrowers to renew items twice (as long as there are no holds on the title) which means I can have something out for nine weeks and still not manage to read it. I excel at that. Nice haul! I’m hoping to give Dancing Fish and Ammonites a try as well! I think I have to be in the right mood for Lively. Sometimes her philosophical musings can be a bit too much for me but we’ll see how well we match up this time around. The new Judy Blume book is on my tbr list. Enjoy your loot.